Investigators have new information about the small plane that crashed in northwest Iowa Tuesday, killing the three Wisconsin men who were aboard. 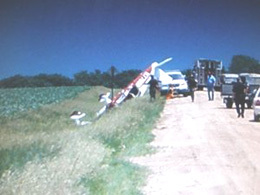 Aaron Sauer, an investigator with the National Transportation Safety Board or NTSB, says it looks like the plane tried to land in a corn field prior to crash landing. He says there’s a 100-foot track from where the plane touched down to where it hit the ditch embankment, killing all three passengers. According to Sauer, the men were — as suspected — on a hunting trip. He says they left Fort Atkinson, Wisconsin, on the way to South Dakota sometime on Tuesday. Exact timing is uncertain because no flight plan was filed. A handheld G-P-S recovered at the crash site may provide some flight path details. Sauer says there was no emergency call made before the crash.